Heavy metals are toxic and can even cause serious and fatal conditions if left unchecked. While heavy metal poisoning is rare these days, it’s possible that you are exposed to toxic heavy metals every day in the air you breathe, the water you drink and the food you eat. The heavy metal burden is when your health suffers from those heavy metals you are routinely exposed to. The presence of heavy metals in the body has been linked to everything from memory loss to fatigue to personality changes. They accumulate in your body over time and can cause health problems like autoimmune diseases, cancers, neurological problems and chronic fatigue. Levels of mercury, tin, lead, arsenic, aluminum, and cadmium can be monitored using a lab test. Heavy metal detoxification is the process of ridding the body of these toxic metals through a variety of means, including eating organic fiber-rich greens, hydration and exercise, nutritional supplements, herbal mixtures, intravenous injections, oral chelating agents, and safe mercury removal of dental amalgams, or fillings. Positive health effects can be achieved by reducing the body’s toxic levels of these metals. Once the heavy metal burden is relieved, other parasites, yeast, and organic detoxification proceed easier. At Aesthetic Anti-Aging Clinic of Chicago(3AC), we treat heavy metal toxicity and address mercury, heavy metal or other burdens affecting your health. The 3AC team zeros in on the root causes. 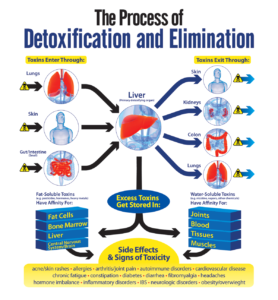 The result is that instead of putting patients through treatment for many individual symptoms- difficulty concentrating, irritability, etc.- we target the root cause and administer a detoxification therapy that removes the toxins and supports whole-body healing to sustain robust health.